The History of "Capoferri" GR3 Pantera #7395! A Real Genuine GR3 Machine! My Pantera is chassis #7395. It matches well with the information available, and therefore, I know I have a real genuine GR3 Pantera chassis, built by the factory as a GR3 Pantera. NOT a standard, L, GTS, GT5 or GT5-s with GR3 equipment! GR3 is a model!! just as the L GTS GT5 etc. I have a certificatefrom from De Tomaso factory that says that Pantera #7395 was built and sold in 1975 to Italy. It is a GR3 model extra equipped with a spoiler and was white with black interior. According to De Tomaso Race Cars* is Achilli Motors the first owner. It is WRONG! !, the first owner was PRO Comet Srl from Milano. 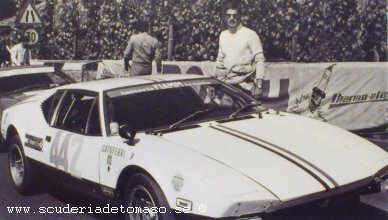 Achilli Motors was a De Tomaso dealer, Gabriele Gottifredi (the owner of Achilli motors) competed with a GR4 Pantera #2858 in the name Achilli Motors. Perhaps Achilli Motors sold the car to PRO Comet Srl, but Achilli Motors have never owned #7395. In the De Tomaso Race Cars book* it says that Anna Bufaius was the owner in 1986 and that Panza Claudio owned it in 1990! WRONG!! the car was in Sweden 1986. I have now a new papper Italian official certificate with all the old owners and all registration number the car had in Italy. Now I have four (4) owners and three (3) registration numbers in Italy. (and lots of new questions!) In Italy (some years ago), when a car change region, its registration numbers change also! The correct is according to the Italian official certificate. The first owner I have is a company, PRO Comet Srl Milano they owned the car from 15-05-1975. Anna Bufaino (note the spelling) from Como (CO) Lombardia, was the owner from 08-05-1976. Than was it a "new" owner from 21-01-1978 Aldo Ferranio also from Como (CO) Lombardia. Then we have Claudio Panza from Bergamo (BG) Lombardia from 25-05-1979, to 1986-03-27. Registration Numbers in Italy, is first MI202640 (Milano) 27-04-1974. How comes Marco Capoferri into this? According to the paper from De Tomaso so was the car for Marco Capoferri! Marco Capoferri have not owned the car, but the car was made for him. In fact, the car had no registered owner when Marco Capoferri start competed with it. The first race I have is 16 March 1975 European Hill Climb race at Ampus â€“ Draguignan (France) so atleast "some" days before that must the car has been finished and delivered to Marco Capoferri. 27-04-1974 MI202640 (Milano) no owner!? 30-11-1976 CO473262 (Como) Bufaino Anna. 18-09-1979 BG536955 (Bergamo) Panza Claudio. 15-05-1975 PRO Comet Srl Milano!? It has competed with #7395 in Italy. see Race History! Photo of #7395 in 1986, the first photo in Sweden? Right rear-view mirror: On fender above the wheelhouse. Left rear-view mirror: On the door. FIA main switch: On left fender, close to the windshield. Wheels: 8" and 10" x 15"
Colour: white overall, with satin black below the crease in the panels. Stripes: (green, white and red (Italian flag colors).In the centerline of the car, from the front of the car over the roof and to the end of the car. Decal: DE TOMASO PANTERA (with white text). On the side of the car. Decal: NETTUNO Scuderia (red white green). On the rear fender. Between door and rear wheelhouse. Right rear-view mirror: Black Vitaloni California on the front fender above the wheelhouse. FIA main switch: Black Vitaloni California on the front left fender, close to the windshield. If you know anything about the #7395, Pro Comet SRL in Milano or Marco Capoferri Pantera please let me know! Photo of #7395 in 1991, a GT5 wing on a GR3 a sacrilege! Olgiate Molgora 1974/75? Mr. Capoferri is the owner on the DeTomaso Paper!? Milano 15-05-1975 MI202640 got the reg number already 27-04-1974!? Photo of #7395 in 1996. The car look like this when I bought it.